KidzWay is designed to share and foster a love for the gospel with your child in mind. Kids have the opportunity to participate in the KidzWay mission: Sharing the light of Jesus with our kids! Your child’s safety is very important to us. That’s why we’ve set up a check-in system and carefully screened and trained volunteers which gives parents and guardians the confidence knowing your children are safe in our care. For your first visit, stop by a KidzWay check-in kiosk in the Auditorium Foyer and allow 20 minutes to get your child connected and to their classroom. At 9:00 & 10:45am, your children have the opportunity to grow with the Big Idea studied for kids 9 months-5th grade. Soul Patrol, our children’s choir, is a great way to see kids learning to love music! They rehearse on Sundays at 10:45am in Room 234, and are open from age 5 to 5th grade. It is expected that children involved in the Soul Patrol rehearsal 2nd service attend KidzWay programming during the 9:00am service. Two check-in tags will be dispensed, and parents/guardians are required to transport their children to Room 234 between services. Children are picked up directly from Room 234. Soul Patrol sings once per month in the worship service, and performs two musicals each year. We are excited to partner with you as you make the commitment to guide and invest in your child as they grow in Christ. Having your child dedicated is a public commitment before God, your church, and your family. 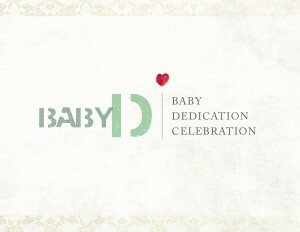 You can take the next step to have your child dedicated during morning services by attending our Baby Dedication Class. If you have a small child who struggles to sit through a service on Sunday mornings, the Family Room is the perfect place where you and your child can spend time together. This room includes: a live video feed of the service, seating area, changing table, nursing rooms, and toys. Stop by The Hub on Sundays to learn more.